NBC5’s Wayne Johnson and Bartlett Illinois’ Wayne Johnson combine recipes to make a chicken stock and a pesto chicken noodle soup. I received a number of requests this week for soups, chili, lasagna and comfort food for fall weather. I’ve already shared two of my favorite chili recipes, my Texas chili and Rob Elgas’ chicken chili. You can get Rob’s chili here. My Texas chili recipe is below. I also received a recipe for making chicken stock using a pressure cooker from Wayne Johnson of Bartlett, Illinois. So, under the category of “great names think alike”, I took Wayne’s stock recipe and combined it with a chicken soup with noodles and pesto. Sautee onions and celery in olive oil for 5 minutes. Add carrots for another 5 minutes. Add tomatillos for 4 more. Add to stockpot. Add chicken, cumin, salt and pepper soup base and water. Bring to a boil and then simmer for 10 minutes. Add pasta and red wine vinegar and simmer for an additional 15 minutes or until pasta is done. Thin with water or additional stock if necessary. Season with additional salt and pepper, if necessary. Serve with a half of a teaspoon of oregano pesto (optional, and you can use standard jarred pesto as well). In a small skillet over medium heat, toast the pine nuts. Watch closely. Once the pine nuts begin to brown, (they burn quickly), Remove them from the heat and allow them to cool. Place the oregano, basil and parsley in a food processor. Add olive oil and pulse until the mixture starts to blend. Add pine nuts, garlic, salt and pepper and continue to pulse. Add cheese and continue processing until smooth. Pour pesto into an airtight container. Cover with a thin layer of olive oil and seal until ready to use. One Roasted Chicken, from the hot foods section of your grocery store. Preheat oven to 400 degrees F. Remove the meat from the chicken carcass. Separate the skin and fat from the chicken meat and set aside. 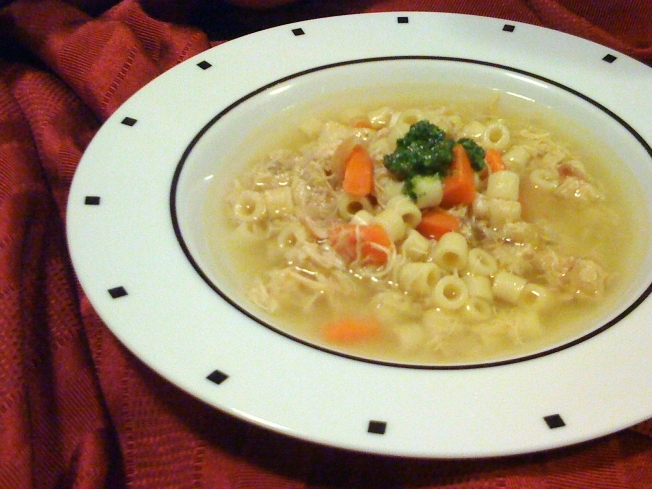 Store the chicken meat in the refrigerator until ready to use for soup. Separate the chicken bones and chop the larger ones in half to expose the marrow. Place the bones on a baking sheet that has been lightly coated with cooking spray and bake for 25 minutes. Meanwhile, heat the water, celery, onions, carrots, bay leaf, cloves, salt, pepper, thyme and parsley in a pressure cooker with the top off. Once the bones have baked, add them to the pressure cooker, then cover and cook under high pressure for 1 hour. Allow the steam to release from the cooker. Strain the mixture and then refrigerate. Once chilled, the fat will rise to the top. Skim off the fat and then strain the base one more time. You can now freeze the base in small batches or use it immediately. Wayne advises that if you down boil down the base for a denser strong flavor then a 50% mixture of his soup base with store bought chicken stock will "add another dimension, a pleasant finish while keeping our dishes better than store bought." With the chicken recipe above, I used the base as is and simply added water. The other elements all combined well for a nice overall flavor. Remove stems and seeds from the ancho chilies. Place chilies in a bowl and cover with two cups of water. Soak for 1 hour. Drain chilies and reserve water. Finely mince chilies and set aside. Meanwhile, cook bacon in a large skillet over medium heat until bacon is slightly crisp. Add onions, green pepper, jalapeños and garlic. Sauté until onions are translucent, about 5 minutes. Add cumin, oregano, paprika, cayenne pepper, and chili powder. Sauté for an additional 2 minutes. Remove from heat and transfer ingredients to a large stockpot. Season the beef with salt and pepper. Return skillet to a medium heat and sauté beef in olive oil until brown, about 5 minutes. Transfer beef to stockpot with a slotted spoon. Add beef broth, ancho chilis, and the 2 cups of water used to soak the chilis. Bring mixture to a boil and then reduce heat to a very low simmer. Place the corn masa in a bowl and slowly stir in the remaining cup of water. Mix thoroughly to remove any lumps. Add mixture to chili. Simmer chili uncovered for about 2-1/2 to 3 hours, stirring on a regular basis. Be sure to keep the temperature as low as possible. Add more water if necessary to keep beef just barely covered. Serve with shredded jack cheese, sour cream, sliced jalapeños, hot sauce and cornbread on the side.